We are open 24 hours a day and 365 days a year to meet your emergency needs. "Excellent care - from the 3:30 a.m. phone reception, to welcoming us to the clinic. Staff, Doctors, all were professional, compassionate, thorough in the diagnosis and treatment of my beloved dog. They listened to me and responded with understanding and communicated clearly our options. Grateful they're here and definitely recommend." 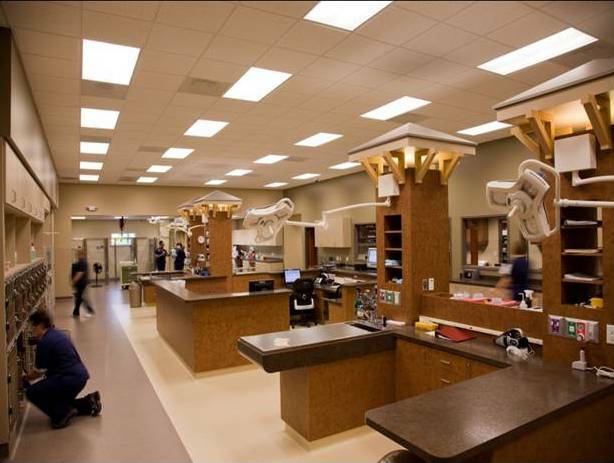 Triangle Veterinary Referral Hospital offers a wide range of emergency services for your dog or cat. Whether it’s a minor illness or life threatening trauma, our caring and highly-skilled staff will be there for you. We’re open 24 hours a day, 7 days a week, 365 days per year, so please let us help you anytime. In most cases, it’s best to call your primary care veterinarian first during the times when your veterinarian is open for business. Many times your veterinarian can provide care for your pet in an environment that is more familiar to you and your pet, and often in a location that is closer and more convenient to you. If your veterinarian is busy seeing other patients or believes that your pet needs to be cared for at TVRH, they will let you know, and we will be happy to help you and your pet. We can also help you and your primary care veterinarian care for your pet when your veterinarian’s office is closed (nights, weekends, holidays). If your pet needs “intermediate care”, such as monitoring after surgery or to continue care for an ongoing illness, we work as part of the overall health care team for your pet. Please be aware that patients will be triaged by the nursing staff, and more seriously ill pets may be seen before less ill pets.